HARD TO TELL WHERE THE PANTS END AND THE SEAT STARTS… by Jim Corbran, Automotive Columnist If you were around in the 1970s you may recall a few cars from American Motors which featured Levis®-inspired interiors. 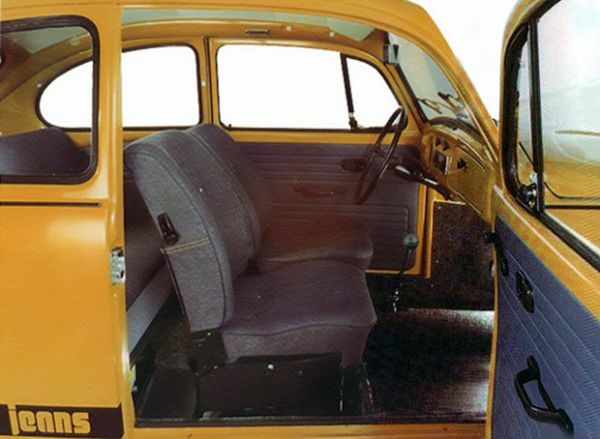 Maybe you even remember the much rarer 1973 VW Jeans Bug, which also featured a denim-inspired seatcovering material and door cards, along with exterior striping, badging, and special wheels. At any rate, VW has just announced a new, 2016 Beetle Convertible Denim Special Edition, which goes on sale featuring a light-blue and silver dashpad along with, as VW describes them, “jeans-inspired seat pockets.” The light-blue cloth seat surfaces are denim with white piping and dark-blue leatherette accents. It is being be offered in a choice two exterior colors: Pure White and Stonewashed Blue, both with a convertible top finished in Dark Blue textured like denim. Pricing starts at $25,995 More info? See the Beetle Convertible Denim here. ### The post HARD TO TELL WHERE THE PANTS END AND THE SEAT STARTS… appeared first on Buffalo Cars.